The Larson Electronics HUL-LEDP1X10W-RND-C Spotlight is a rugged and effective LED spotlight designed to provide users with a powerful, durable, and easy to use source of reliable light. This spotlight has a 10 watt LED assembly which produces a light beam approximately 650’ long. Multiple color choices available, including red and green for hunting, amber for fog penetration, blue for snow and artic conditions, and a clear diffused lamp for a wide spread floodlight. 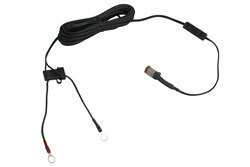 This handheld spotlight includes a detachable 16 foot coil cord with cigarette plug for easy connection to vehicle and equipment power sources. This durable and weatherproof spotlight is ruggedly designed to withstand heavy duty use and includes a 16 foot coil cord and cigarette plug adapter to allow connection to any vehicle or ATV equipped with a cigarette plug. This light contains a single 10 watt LED emitter paired with a precision aluminum reflector and impact and scratch resistant lens. This beam is strong enough to allow operators to read signs, license plates, addresses and other similar markings at the far end of its total range. This handheld spotlight is equipped with a snap-on lens to provide colored or diffused light output. Options include red, blue, green, amber, or clear lenses. Additional lenses (LEDP1X10WRE-RND-LENS) can be purchased seperately, allowing operators to quickly change the color of the light in the field. Please select lens type below. Red lenses are best suited for dust. The red color pierces through the dust and improves visibility where other colored light sources may provide low to zero visibility. Red lenses are also used for hunting applications, where predators at night are less sensitive to light in the red end of the light spectrum. Blue lenses are best suited for snow and arctic conditions. Operators will experience less glare and reflection from the snow, and will be more noticeable to oncoming traffic. Green lenses are extremly popular for hunting applications. Similar to the red lens, the animals are less spooked by green light than visible white light. Green light output is commonly used when domestic animals may be coming into the call, to better differential the target animal before taking the shot. The green light output is brighter to the human eye than red, making it the first choice when hunting darker prey, such as wild hogs. Amber lenses are best suited for fog and water environments. The amber color penetrates the fog better than higher color temperatures, reducing glare and increasing visibility under high fog conditions. Clear lenses diffuse the light without changing the color. In the spot configuration, the clear lens is used to protect the face of the light fixture. This spotlight is built for durability and comfort with an impact resistant housing, an ergonomically designed 5 inch tall polycarbonate handle that matches the contours of your hand, and a light head that can be adjusted vertically. The 5.5 inch diameter lamp and reflector assembly is protected by a polycarbonate lens that is sealed against water and dust to provide an IP68 rating and weatherproof protection. 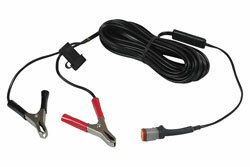 Power options include 12-24 volt DC for use with most common vehicle, boat or ATV electrical systems. The light draws 0.84 amps @ 12V and 0.42 @ 24V. This spotlight is a powerful and rugged design ideal for use in hunting, utility, emergency, industrial/commercial and military/law enforcement applications. Durability-Convenience: The HUL-LEDP10W Spotlight is constructed of impact resistant materials including a nylon housing and polycarbonate handle. The lamp assembly contains an aluminum reflector and borosilicate hardened glass lens. The lamp assembly is sealed against water and dust and the entire unit is IP68 rated waterproof to 3 meters. 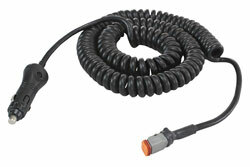 Power: Each HUL-LEDP10W Spotlight comes with a detachable 16 foot coil cord with cigarette plug. 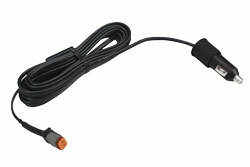 The cord is detached via a weatherproof, 2 pin Deutsch connector which easily and securely attaches and detaches the coil cord from the spotlight. Other cords, including 21 foot cords with ring terminals (C-21RT), 16 foot cord with spring battery clamps (alligator clips) (C-16BC) and a 16 foot straight cord with cigarette plug (C-16CP) are available. This light on 11-32V DC, including 12 volt or 24 volt DC, allowing it to be used with any vehicle or ATV equipped with a cigarette plug. Choose voltage below when ordering. Versatility: The entire unit weighs only 1.2 lbs. The light head is mounted to the handle with an adjustable hinge that allows the head to be adjusted vertically. The five inch tall handle is ergonomically designed to fit the contours of your hand for a comfortable grip. This unit is ideal for hunting as well as military, security and law enforcement use and any application that requires an extremely durable and effective source of portable illumination. Lighting Configuration: The HUL-LEDP1X10W-RND-CR has several beam configurations that the operator can choose from to better suite their applaication; 10° Spot, 20° Wide Sopt, 40° Medium Flood and a 60° Flood.